Lake Garda Villa Rent with lake view, pool and large park. Contact us! 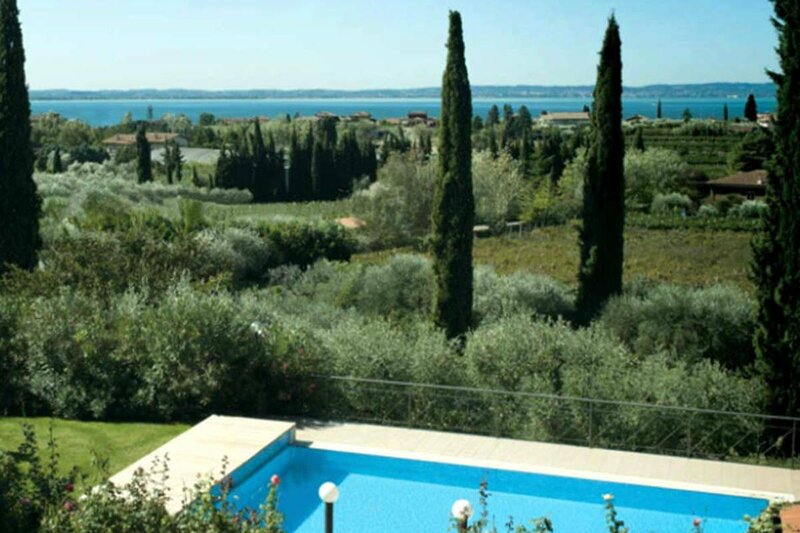 Italy, Lake Garda Villa Rent with panoramic swimming pool offering a beautiful lake view. It is surrounded by a very large park of two hectares (5 acres). 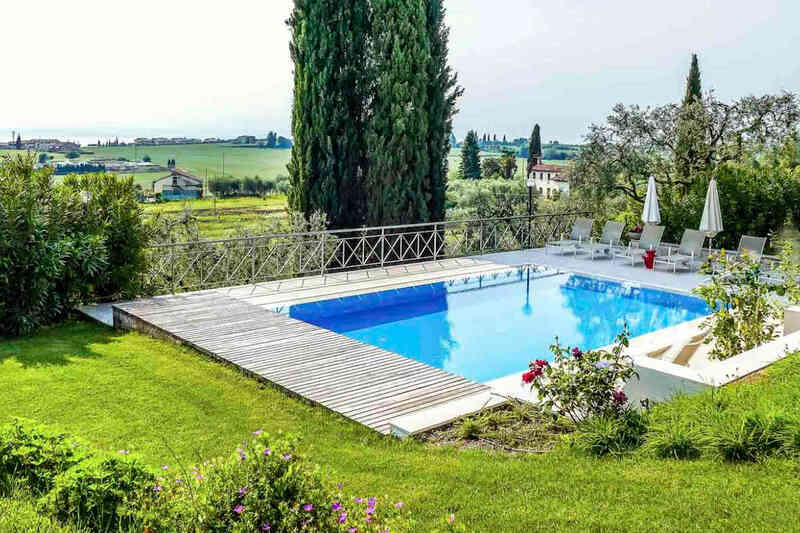 This Lake Garda Villa Rent guarantees total privacy and relax to up 14 guests (8 guest in double-beds + 6 extra guests in comfortable sofa-beds). 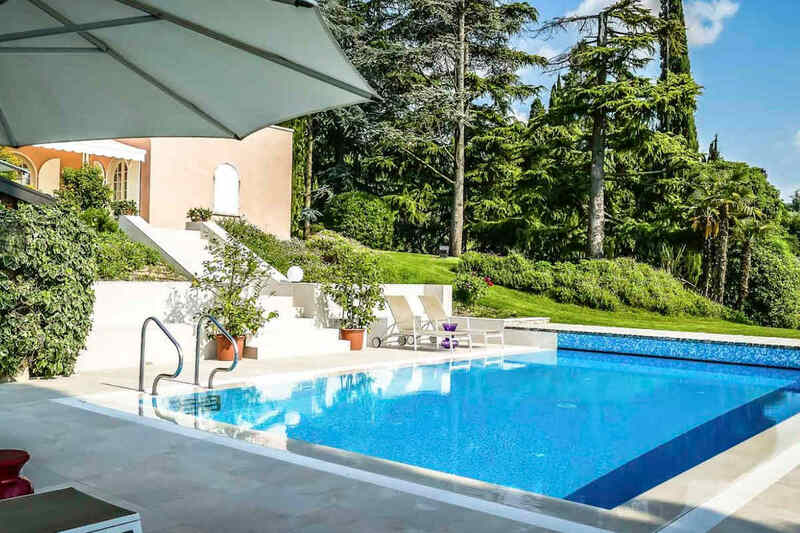 This Lake Garda Villa Rent, built at the beginning of 1900 has been richly renewed with all modern comfort. It is a very exclusive and elegant Italian retreat with great personality. This Lake Garda Villa Rentis a charming place. Perfect for a family reunion and for friendship vacation. Or for an unforgettable marriage or a business event. In this Lake Garda Villa Rent you’ll find a warm atmosphere with a wonderful lake and surroundings view. At ground floor there is a large but cozy dining area, a spacious kitchen equipped with all the latest comforts, a living room with a beautiful fire place and a studio-library. The terrace, covered by a large awning, is perfect for eating “al fresco”. Contact us for details. 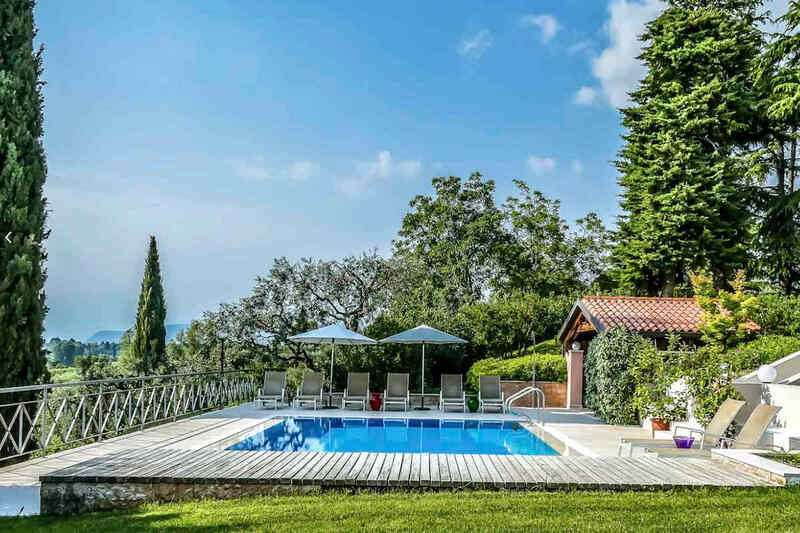 The Lake Garda Villa Rent is on the gentle hills of Garda lake and it offers beautiful panoramic views of the lake and the surrounding countryside. The Villa position allows to quickly reach places of culture, history and fun. 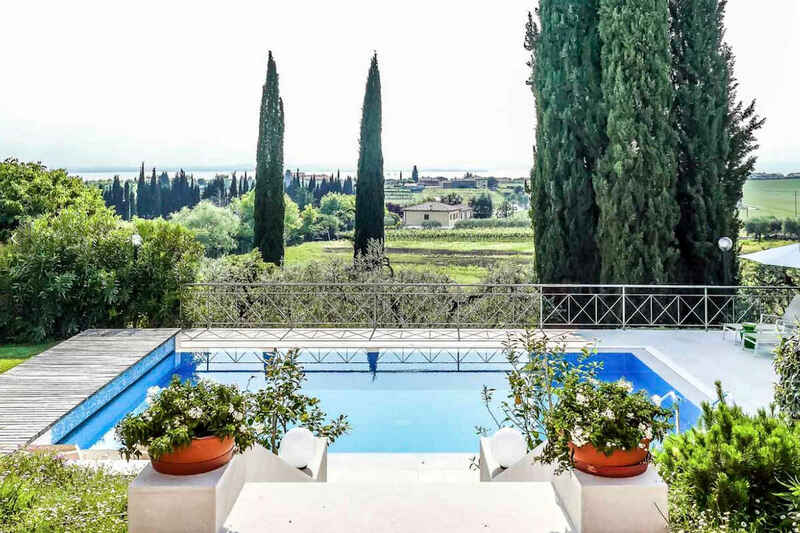 The art city of Verona is reachable in twenty minutes by car from this Lake Garda Villa Rent. Venice, Milan, the Alps and the Dolomites are just an hour away by car or train. Everywhere in the Lake Garda Villa Rent you find an elegant italian style and a cozy atmosphere. The furnishings of the Lake Garda Villa Rent are of excellent quality, consisting of both antique pieces and modern design furnitures. The Villa first floor comprises four large indipendent suites, all with private en-suite bathroom. The suites can host a maximum of 14 guests (8 guest in double-beds + 6 extra guests in comfortable sofa-beds). Suite One: 2 people in in double bed. One bedroom and a sitting room with no bed and one bathroom. Suite Two: 2 people in double bed and 2 people in sofa bed. One big room with no separation and one bathroom. Suite Three: 2 people in double bed and 2 people in sofa bed. Two rooms with independent entrance separated by a sliding door and one bathroom. Suite Four: 2 people in double bed and 2 people in sofa bed. Two separated rooms and one bathroom (must cross the sitting room to reach the bedroom). In this Lake Garda Villa Rent you can enjoy the tranquility of nature. Surrounded by vineyards, olive trees, and an enchanting landscape. 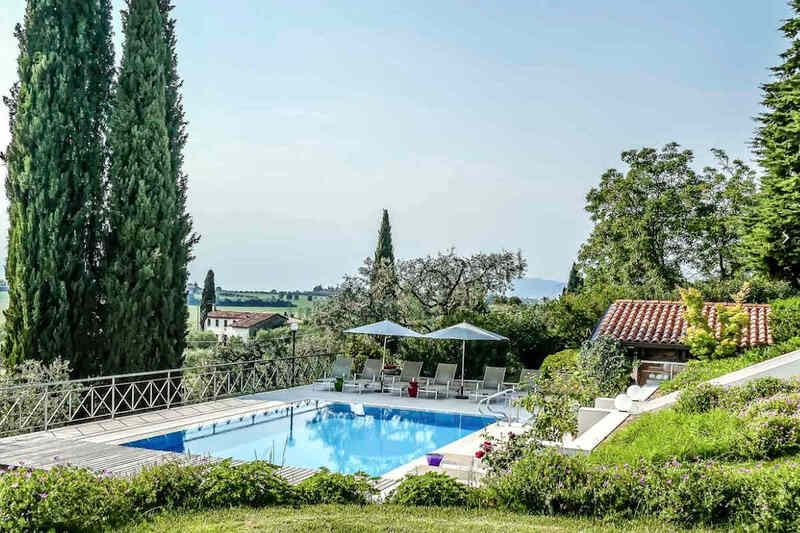 The swimming pool area in the centenary park of this Villa Lazise Rent offers a beautiful view of Lake Garda and the surrounding countryside. The patio around the pool hosts modern sun-beds, umbrellas and an open-air shower. A covered area at the pool side is equipped with refrigerator, washbasin and table with chairs. The Lake Garda Villa Rent offers you all the services and amenities to ensure the comfort of a perfect vacation. At request, we can also arrange for you all the special services that you can find both in a five star hotel and in a private home run by professional staff. This Lake Garda Villa Rent can be rented for minimum stay of a week from Saturday to Saturday. The sleeping area of the Villa is composed by 4 independent suites with private bathroom. The Villa can host a maximum of 14 guests (8 guest in double-beds, 6 guests in sofa-bed). Air Condition, Winter Heating of the Villa and the Pool must be paid according to consumption. Only payments by Bank transfer are accepted, no credit card. A deposit of 30% of the total rental price has to be paid by bank transfer in order to confirm the booking. The balance of the total rental has to be paid in full within 60 days before the check-in.